GM's chief financial officer explained this past week just how GM is already preparing for the next U.S. downturn -- whenever it happens. Big sales of SUVs and pickups like this GMC Sierra Denali helped power GM to big profits in 2015. Sooner or later, those sales will fall -- and GM is already preparing for that moment. Image source: General Motors. 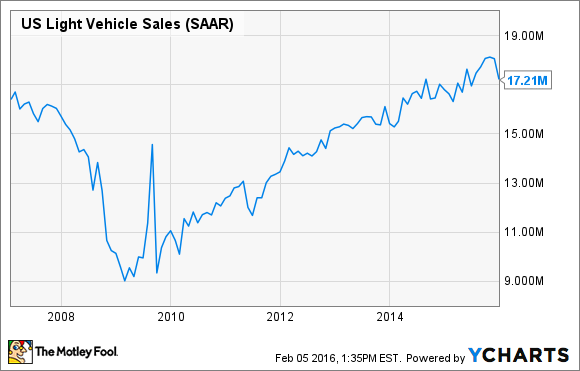 Did U.S. auto sales peak in 2015? Or did they just hit a plateau, with a few more years of good numbers left to come before the economic cycle ends? Lots of investors apparently subscribe to the former view, given that most auto stocks took a beating last month. General Motors (NYSE:GM) was one of them: Despite a fairly upbeat forecast for 2016, GM's shares tumbled over 11% in January. The General's shares took another hit this past week, falling almost 4% on Wednesday after GM's fourth-quarter earnings report blew away Wall Street's optimistic estimate. GM's chief financial officer, Chuck Stevens, said during his earnings presentation that he subscribes to the "plateau" view, and he made a strong case for it. But he also noted that a downturn is inevitable sooner or later, and he explained how GM is already getting prepared for it -- whenever it happens. During the last big downturn, in 2008 and 2009, General Motors famously crashed into bankruptcy court and needed a U.S. government bailout to get back up and running. Today's GM has come a long way from that train wreck. GM had $20.3 billion in cash as of the end of 2015, with another $12.2 billion worth of available credit lines. On the other side of the ledger, it had just $8.8 billion worth of well-structured long-term debt. There's little question that GM has the funds to get through the next U.S. recession without much of a fuss, especially if it plans ahead. And Stevens said that GM is already doing exactly that. GM is "very aware that downturns are difficult to predict," Stevens said during Wednesday's earnings presentation. "That's why we are planning and running the business accordingly, in essence proactively managing the cycle." He presented this slide to make his case. Image source: General Motors . "So what have we done? Over the past number of years, we've maintained our intense focus on cost efficiency and capital deployment," Stevens said. "We've generated significant efficiencies over the past number of years with even more expected in 2016." GM is in the midst of a push to cut its annual costs by $5.5 billion by 2018. Changes to its logistics, materials-acquisition processes, and some other internal processes have already won about $2.5 billion of that targeted annual savings through 2015, Stevens said. Stevens also noted that GM has become much more careful about where it makes investments. "We've made tough decisions on capital deployment, which includes our downside protection. These decisions included exiting markets where we had no path to viable returns," he said. Since Mary Barra became GM's CEO two years ago, GM has chosen to exit the troubled Russian market, and chosen to discontinue low-profit sales of inexpensive small cars badged as Chevrolets in Europe. Both decisions were characterized by Barra and other GM executives as "capital deployment" decisions, meaning that GM felt it could make a better return by putting its money elsewhere. Our breakeven point in the U.S. has been maintained at an industry level of between 10 million and 11 million units as we've kept our fixed costs flat over the past number of years," Stevens said. "And we've refrained from taking volume and share as we focused on profitable retail growth." Stevens was referring to the annualized rate of light-vehicle sales in the United States, a number known in the industry as the "SAAR", for Seasonally Adjusted Annualized Rate. That number is typically calculated monthly. It was 17.21 million in January, meaning that the pace of auto sales was such that 17.1 million vehicles would have been sold in a full calendar year at that pace. Here's a look at how the SAAR has behaved since the beginning of 2007. It only fell below 11 million during the worst of the economic crisis, in 2009 and early 2010. What Stevens was saying is that GM's fixed costs are now such that it should be able to generate a profit as long as the SAAR for U.S. light-vehicle sales stays above 10 million to 11 million. (Executives at Ford say that the Blue Oval's break-even point is at about the same level.) That's a level that might not be reached at all during a mild or moderate U.S. recession. Stevens also noted that GM's vehicle inventories are down significantly. GM had about 100,000 fewer vehicles in its U.S. inventory at the end of 2015 than it had a year earlier, he said. GM has also restructured many of its employment arrangements since the last downturn, giving it more flexibility to cut back production (and workers) if and when the market slows. "And finally," Stevens said, "although keeping cost out of the system and looking for efficiencies are big drivers to protecting profitability in downturns, we are also executing several growth opportunities such as GM Financial, Aftersales, OnStar and global Cadillac that are somewhat independent of the vehicle cycle, fundamentally to improve our quality of earnings, peak-to-trough. We believe execution of our proactive downturn planning will enable sustained performance through the cycle." The initiatives mentioned by Stevens are all major long-term efforts intended to help boost GM's global profitability by early next decade. They include the ongoing global buildout of its captive-finance unit, GM Financial; efforts to improve ongoing customer retention and generate ongoing revenue streams by offering in-car 4G connectivity and other services via OnStar; and the $12 billion effort to overhaul GM's luxury Cadillac brand and turn it into a serious rival to the German luxury-car giants. While GM made a case for its view that a downturn in U.S. auto sales isn't imminent, Stevens made it clear that GM knows that a downturn is inevitable, sooner or later. He also made it clear that GM is making ongoing efforts to keep costs under control, improve GM's global efficiency, invest in the most profitable lines of business (and cut its losses in unprofitable ones), and work on new lines of business that could generate significant new profit streams in time. Long story short: GM's management team is on top of things, to the extent that the future can be foretold. Whether U.S. auto sales start to slip in three months or three years, it looks from here like GM is well-prepared to weather the storm.